Insiders Cash Club review - SCAM? No one told you this! Home > Online opportunities > Insiders Cash Club review – SCAM? No one told you this! Insiders Cash Club review – SCAM? No one told you this! Welcome to my Insiders Cash Club review! Wondering if you will make thousands of dollars with this system? Or is Insiders Cash Club a scam by Jeffrey Hart that you should be avoiding? First of all, I need to congratulate you for taking the time to do your own research before buying another money-making product. You might already know that there are too many scams out there, so doing your due diligence is the way to avoid the terrible scams and discover the legitimate way to earn money online! When it comes to the Insiders Cash Club, a short answer to your questions is that it’s not as awesome as they told you in the sales video. There are some red flags that you need to be aware of, so I decided to write this honest review to show you the complete truth. 2 What is Insiders Cash Club about? 4 Is Insiders Cash Club a scam? The moment I landed on the Insiders Cash Club sales page, I thought I was in front of another scam page because it looked very similar to other sales pages I came across in the past. But I didn’t want to judge based on its appearance so I decided to look deep into it before coming to a final conclusion. The spokesman, Jeffrey Hart, makes this system sound like the perfect system that will enable you to earn fast and easy cash online. He claims you don’t need any experience or skills and it doesn’t even matter if you don’t know how to use your computer. Everything you have to do is “copy and paste” to make money with this system because he has supposedly done all the work for you. Oh, and the best part is, he’s not asking for any money, his system is completely free! Well, that’s what he says in the first sales video. Honestly, I couldn’t help but laugh when I heard that it’s free because that’s a complete lie. I believe he first wants you to think that this is free to get you to enter your name and email address in the form. In the first sales video, he says nothing about how this system works. The first sales video is full of hype and fake claims. So I entered random details to get access to the second video and it was very overhyped as well. He makes this system sound like something you can use to make instant cash with minimal effort. It’s said to be a system that makes the sales automatically. Everything he says sounds amazing, but he doesn’t tell you much about how this system works. At the end of the second video is when you realize that this is not free at all. He claims that you need to pay a fee to help cover his monthly personal costs for customer support agents. Insiders Cash Club does not work like they tell you because there’s no system that can make you money the same day you get started. They make this system sound very easy when they say that you only have to click a few buttons, but the truth is that this is something that doesn’t exist. There are no products or systems that make it easy to earn money because the Internet is not an ATM machine. Most people would have already made a fortune online if magical money-making systems existed. So that’s it. Buying into this Insiders Cash Club product will not make you money in no time. You will be provided with some training about various ways to make money online, some webinars and an e-book. The thing is, there’s no in-depth training or step-by-step training that can help you get started from zero without getting lost. I have reviewed hundreds of products like this and they usually undeliver or provide outdated information that cannot help you make the kind of money they talk about. Also, there are lots of red flags that already prove this Insiders Cash Club product is not to be trusted. Remember the people who appear in the first sales video and claim to have earned money in a few days after having tried this system? Well, I’m sorry to say this but the truth is that these people have not even purchased Insiders Cash Club. They are not real members. Instead, they are Fiverr actors who have got paid to recite the scripts given to them. 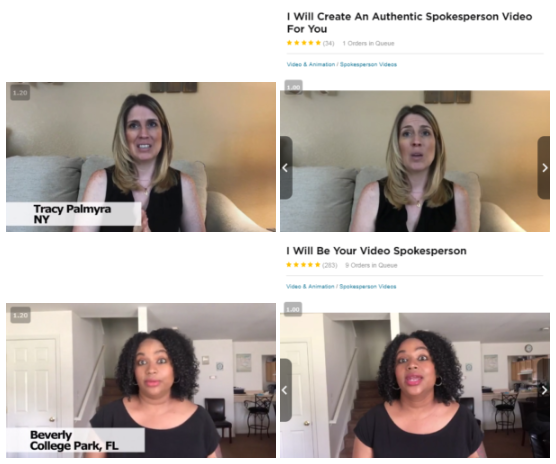 These people haven’t made any money with this system because, if they had, they wouldn’t be selling video testimonials. It’s clear that Insiders Cash Club is not as great as advertised, since they wouldn’t be using fake testimonies if members were having success. I haven’t found any positive Insiders Cash Club review so I believe no one has made money with this sysem, except the owners and affiliates who are promoting it. When the first video starts playing, we can see a news report about working from home. These news report have nothing to do with Insiders Cash Club. They don’t even mention the name. As I said, I have written hundreds of reviews and it turns out that many programs have used this fake news report for their sales videos. 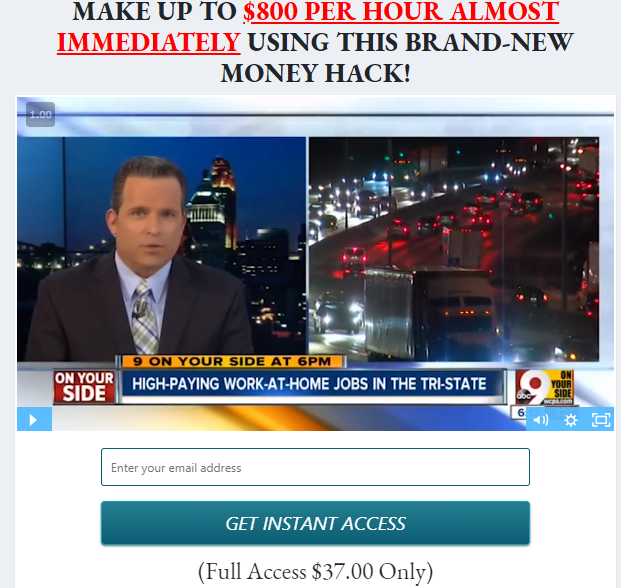 These fake news report are usually found in the get-rich-quick schemes kind of products. In this case, Jeffrey claims how tired he is of the gurus and scammers who take advantage of innocent folks, but I don’t see how he is different. He talks about the con artists but the way he’s marketing this system is like the typical get-rich-quick scam. Scammers usually talk negatively about other scam artists to get you to believe that they are on your side, so that you think that they are not going to scam you. They tell you that there’s limited time to join or limited amount of spots. This is an old trick that has been used for years and years. In this case, the spokesman claims there are only 50 spots available and they are filling out fast. 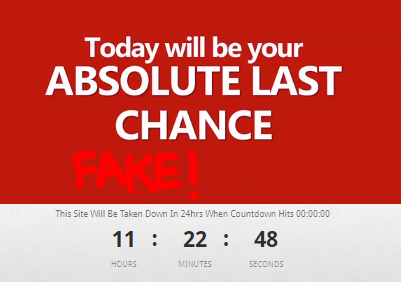 Not only that, there’s also a fake countdown on the sales page. I say that it’s fake because the sales page will not be taken down in the next 24 hours. You can check it out tomorrow and you will see that nothing has changed. If you think about it, why would these unethical marketers limit the amount of money they can earn in the first place? The truth is that they want to reach as many people as possible to make as many sales as possible. That’s their real goal. After watching the two sales videos, I went to the checkout page where I found two testimonials. These people have supposedly joined the Insiders Cash Club system some months ago, but after doing some research I can confirm that they are not real members. I found the same testimonies in another checkout page. Some differences are the name of the program (highlighted) and the date these people have supposedly joined. It’s clear that these comments are invented and these people are not real members! I mean, why would they join two programs and write the same comments? It’s all a complete fabrication. The man and the woman who appear on those pictures might not even know that their pictures are being used to do false advertising. 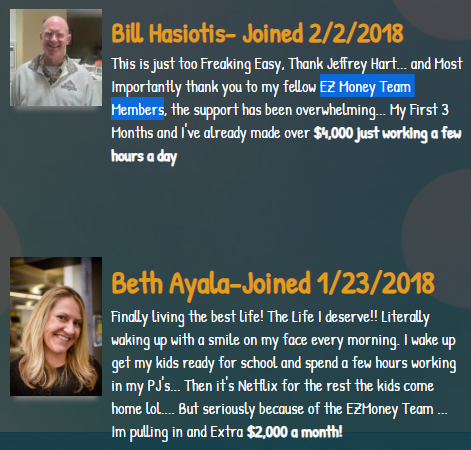 Not only that, EZ Money Team (in the second screenshot you can see they mention it) was a low-quality/scam program that was out some months ago. I guess Insiders Cash Club is a rehash of EZ Money Team because they use the same unethical sales tactics. When a scam gets lots of negative reviews, scammers change its name to mislead potential victims. They don’t want people to find honest reviews like mine. Another thing you cannot trust is that they have been seen on ABC, CNBC or Fox. You can go to those news sites and you will not find anything about Insiders Cash Club. There’s no connection between these companies and this program. The truth is that they have those logos on the Insiders Cash Club sales page to gain credibility. They want to look legitimate and valuable. If you are still wondering if Insiders Cash Club is a scam, I’ll let you be the judge. Some people might not consider it a scam because they give you something for your money. You might learn something from the training provided, but it will not help you make the kind of money they talk about. Other people will call Insiders Cash Club a scam because of the fake claims and deceitful tactics they use to sell it. So I took a look at the Ortiz Capital LLC website and I didn’t like what I read in their disclaimer. So there you have it. The average person who buys this program doesn’t make any money. Honestly, I wouldn’t want to do business with a company that does false advertising on their sales pages and then says that the typical customer doesn’t benefit from their stuff. Because of this and everything I have mentioned above, I conclude that I don’t recommend Insiders Cash Club. If you are serious about making a full-time income online, you need to keep in mind that it’s going to require you to put in the work and time. No “done-for-you” systems or magical programs work to make a long-term living online. I personally got involved in some done-for-you programs in the past and I can say that they’re not the way to go because they end up shut down. That’s why it’s best to build your own online business. That’s what I did and now I am earning a consistent income month after month. I learned about a newbie-friendly business model that has given me a proven path to making passive income online. This method takes advantage of the million of products and services that are available online. It has been working for decades and it’s only getting better because more and more products are coming out every day. Not only that, I also reveal how you can get started today for free! Are you ready to leave the ugly scams behind and start building your biz today? I hope this Insiders Cash Club review has been helpful to you and you will make the best possible decision.